The institution’s desire to construct classrooms, an enlarged auditorium, and updated conservation facilities predates the growth of the collection and increase in attendance experienced in recent years. Properly caring for and providing easy access to Henry Clay Frick’s magnificent art collection and mansion is at the core of the Frick’s mission. In the 1970s, general plans were drawn up for an addition, but the poor economic climate of the period, when the last parcel was acquired, led the Frick’s Trustees to reconsider the feasibility of the project. Instead, they decided to build a modest addition in 1977. The Frick today not only has the ability to raise funds but also developed a new approach to address long-identified, mission-driven goals. 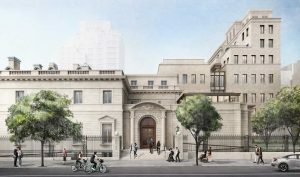 Following a comprehensive search and selection process, the Frick has worked closely for more than a year with Selldorf Architects to develop a design, announced in April of 2018, that will enable the Frick to catch up needs that have evolved over time (refer to the page called “The Plan” for more details). 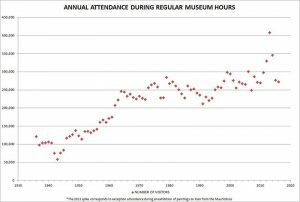 Indeed, the collections have continue to grow and the broadening scope of educational offerings at both museum and library has brought higher attendance numbers and a more deeply engaged public, as evidenced by the numbers below. 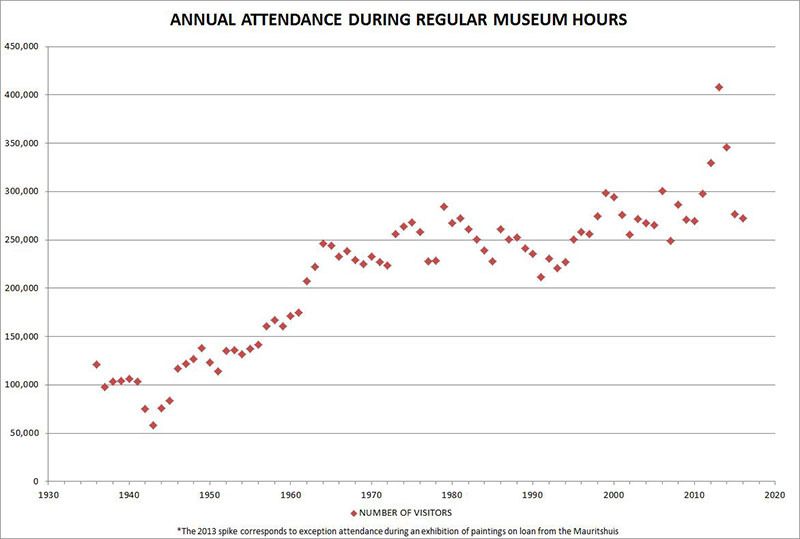 The graph at right shows a gentle but notable rise in annual attendance during regular museum hours over a period of many decades. The 2013 spike corresponds to exceptional attendance during an exhibition of paintings on loan from the Mauritshuis. For a sense of the substantial growth in range of public programming offered and audiences now served, read here.